On the final day of the show, it was center stage for Pony Hunters, WIHS Pony Equitation and the WIHS Regional Finals. 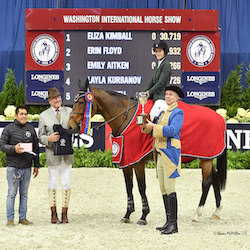 Elizabeth Benson Wins 2012 WIHS Equitation Finals; Hasbrouck Donovan is second. Scott Stewart wins overall Grand Hunter Champion and Leading Rider Award at 54th Annual Washington International Horse Show. Action and fun amped up on Day 4 with international-open jumpers and junior/amateur-owner jumpers in the ring, the popular Gambler's Choice Costume Class and Barn Night activities. WIHS Barn Night 2012 was a Blast! WIHS hosted its opening day on Tuesday, October 23. Hunter riders concluded their competition for championship honors on Wednesday. The competition continues through Sunday, October 28. The Washington International's $100,000 President's Cup Grand Prix-CSI 3*-W will air on NBC Sports Network on Sunday, October 28, from 3:30-4:30 p.m. EST. Bid now! The WIHS Silent Auction closes TONIGHT at 9:00 pm! The Washington International Horse Show is now accepting applications for the 2012 WIHS Youth Ambassador Program. Apply today!